A year has passed since the Tournament. Like I said in my review for The Novice, this book is perfect for fans of Harry Potter, Percy Jackson, and/or How to Train Your Dragon. It’s all about a trio of misfits getting into magical mayhem. There were a few things in book one that made me wary going into the sequel. One was the long-winded paragraphs of dialogue, and two was the more politically- and economically-motivated villains. Thankfully, both issues were, not exactly fixed, but less prominent in the sequel. More action and adventure scenes helped round out the plot this time around, which I greatly appreciated. It’s more interesting to read about three teens using their magical powers versus reading about them trying to stop evil businessmen. 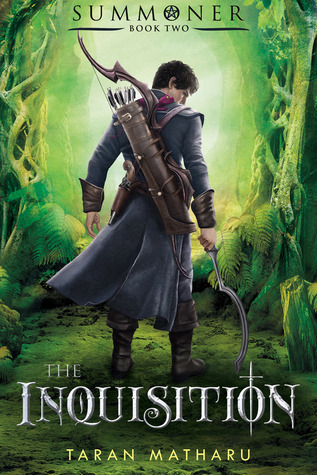 The Inquisition takes places a year after the end of The Novice, with Fletcher in a bad place for the start of the novel. I really enjoyed a lot of the scenarios Fletcher and his friends were put in throughout this book—there were prisons, jungles, and even goblin dogfights—yet I always wanted more focus on those scenarios. Fletcher never really mentioned how any of these situations affected him. I mean, being a prisoner has to be hard on a boy, but Fletcher never discusses his experience. Also, a small plot nitpick, who rewards soldiers with gobs of money for doing their job and saving people? That was a little bit odd, making a game out of saving people’s lives. Other than those couple of things, this book was good. It was a solid sequel to an interesting trilogy. Its cliffhanger ending had me picking up the last book as soon as I possibly could (which means that I’m reading it now). It’s a lighter young adult/upper middle grade read for anyone who needs a good fantasy story in their life. Or for anyone who just likes mythical creatures and wants their own dragon, golem, or griffin.